Driving is allowed on some beaches but you will need a permit. If you cannot book through one of these channels, phone 13 QGOV (13 74 68). Mobile phone charges may apply. All vehicles must be registered and your permit clearly displayed on your vehicle for inspection by authorised officers. Find out about exemptions from paying a vehicle access permit fee. Read more about Bribie Island recreation area. Read more about Cooloola recreation area. 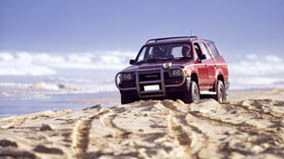 Read more about K’gari (Fraser Island) recreation area. You may buy a combined permit for K’gari (Fraser Island) and Cooloola with a 20% discount. Read more about Minjerribah recreation area. Read more about Moreton Island recreation area. A copy of the renewal advices of the vehicle to which the permit currently applies. A copy of the renewal advices of the vehicle to which the permit is now to apply. Details of new address where applicable. a worker who needs to travel through the recreation area. Inskip Peninsula or Green Island recreation areas. Read more about fee exemptions for vehicle access permits on QPWS managed recreation areas (PDF, 93KB) (operational policy). If you live at Rainbow Beach you may apply for a permit fee exemption for Cooloola Recreation Area (CRA). This will allow you to save a reasonable amount of time travelling through the recreation area to Tewantin's major shopping and business centre, instead of using an alternative route. Only Rainbow Beach residents are eligible to apply and you will need to show evidence of your principal place of residence and vehicle registration. Fee exemptions are not automatically renewed so you must apply for an exemption each year if you hold an annual permit. Read more frequently asked questions about vehicle permit fee exemptions for Rainbow Beach residents. select the relevant park, tick the ‘fee exemption’ checkbox and follow the instructions to submit the request. For Minjerribah recreation area, you can apply online or phone (07) 3409 9668.